I am so grateful to share my good news. 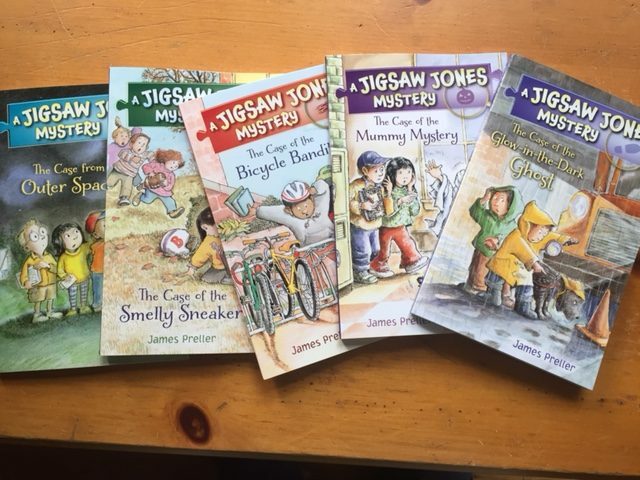 Today you can buy all five of these Jigsaw Jones books in your friendly neighborhood bookstore. These books have been impossible to get for a number of years. I’ve received many queries from teachers, parents, and librarians and I’ve always had to turn them away. Yet despite this, Jigsaw has held on in popularity thanks to school librarians and teachers who have kept old, tattered copies in their classroom collections. Now they exist again: revised, updated, reformatted. Hopefully a new generation of young readers can discover the books for themselves. I can’t wait to visit schools this coming year, free to talk about these books that are so dear to my heart. Publishing note: The Case from Outer Space is all new, and available in both hardcover and paperback. Four additional titles will be released in November, making for nine in all. There are plenty more where that come from!